Polygal has been used in greenhouse construction for many years. It offers a more durable and long-term solution than plastic film. What you may not know is that we carry Polygal sheets that are specifically designed to promote plant growth. 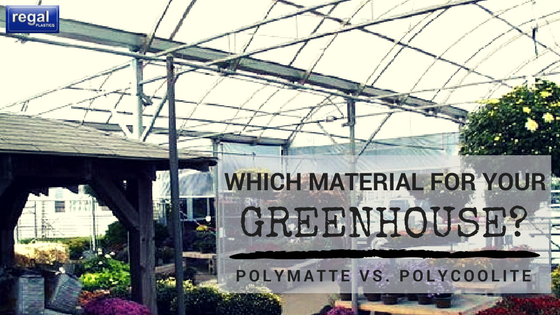 Clear Polygal is the most popular for commercial greenhouses, but we are going to discuss two great options to the clear. Polymatte is a new multi-wall polycarbonate sheet that offers 100% light diffusion. Agricultural research has shown that plants utilize diffused light better than direct light. Plants that are exposed to direct light primarily make food in just their top leaves, but with diffused light, all the leaves are able to receive light, thus maximizing photosynthesis. Polycoolite is a multi-wall polycarbonate sheet with a special coating that blocks the UV rays, supplies high blue and red waves, and reflects heat from the unused green waves. It also reflects undesirable excess heat from the infrared range. In layman’s terms, it blocks the waves that don’t promote photosynthesis. Rigid sheet structure provides for extra strength under wind and snow loads. Reduces or eliminates the need for shading. While both materials are intended for plants, they were designed for different applications. Polymatte is preferred by professional growers and serious hobbyists that start with seeds. The material does not block heat and boasts 100% light diffusion making it a perfect choice for greenhouses. On the other hand, Polycoolite is utilized by those maintaining juvenile to adult plants. It’s an excellent choice for spaces that need to serve dual purposes, such as a garden centers or patios, due to its ability to block heat and manipulate the light spectrum. Hopefully, this overview gave you more insight as to which material is a better fit for your project. We always recommend speaking with a professional before purchasing your material.